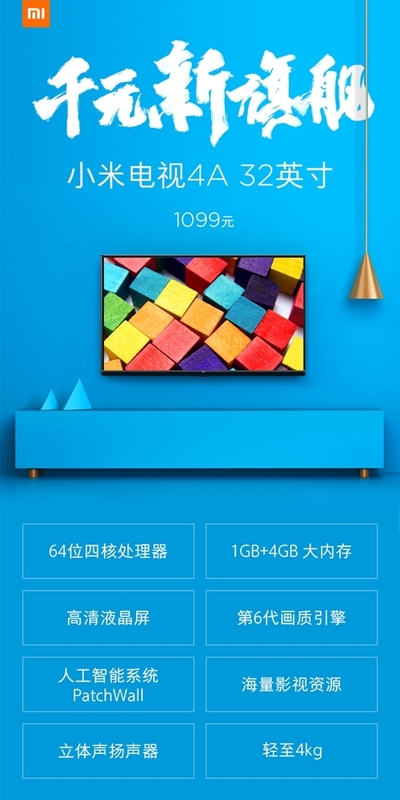 Today Xiaomi revealed details about its new product - a compact TV Mi TV 4A with a diagonal of 32 inches and weighing only 4 kg. The device is made in a plastic case 4 colors. This is the smallest TV of the Mi TV 4A line, it is designed for small apartments where there is no room for hefty screens. Such a diagonal fit well in any room and will not create problems when moving, because the mass of the device is only 4 kg. Resolution 1366x768, refresh rate 60 Hz, viewing angle 178 degrees. A chip with 4 1.5 GHz cores (Cortex A53) and a Mali-450 MP3 graphics accelerator, 1 GB of RAM, 4 GB of internal memory is installed. There are two speakers of 5 watts each, and in the list of connectors are HDMI, AV, S / PDIF, DTMB, USB. The novelty is estimated at 1099 yuan, that is approximately $ 163. The TV will go on sale on July 23rd.